In 1866, when the second design for the double eagle was introduced, America was a vastly different country. The Compromise of 1850 lay as dead as the million young men that had given their lives on battlefields throughout the South. Reconstruction was proving to be a heavy burden on the southern states and also a political quagmire for President Andrew Johnson and the Radical Congress. However, no one in Washington could argue against the idea that the country needed divine direction to heal its recent scars. To that end, the Mint Act of 1865 included a provision that the motto IN GOD WE TRUST be placed on the nation's coins. The idea that a religious motto should be added to U.S. coinage originated in 1861 when Reverend M.R Watkinson of Ridleyville, Pennsylvania-in a letter to Treasury Secretary Salmon P. Chase-urged that coins should carry a "recognition of the Almighty God in some form." The Reverend suggested a design with a strong God and Country theme, and concluded his letter by stating, "This would relieve us from the ignominy of heathenism. From my heart I have felt our national shame in disowning God as not the least of our present national disasters." Obviously agreeing with Watkinson, Chase instructed Mint Director James Pollock to prepare a device for coinage with such a motto in the "fewest and tersest words possible." Over the next several years various mottoes were tried on base metal patterns including GOD AND OUR COUNTRY, GOD OUR TRUST, and finally IN GOD WE TRUST. The new motto was first added to dies for double eagles in 1866. The addition was relatively easy to accomplish by slightly widening the oval of stars above the eagle's head and placing IN GOD WE TRUST within. 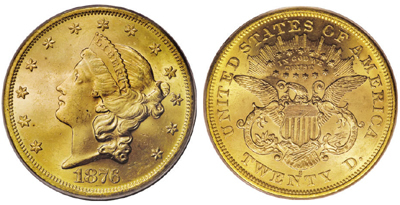 Because of the double eagle's larger size, the addition of the motto did not result in undue crowding of the devices as on the smaller, lower denomination coins. Mint Engraver James Longacre also made two other minor modifications to the reverse: the sides of the shield that were formerly straight, curve outward on the Type 2 coins, and the tail feathers of the eagle are lower and closer to the lettered devices on the lower reverse, requiring smaller mintmarks than on the Type 1 coins. Otherwise, the design was left virtually unchanged, with the large Greco-Roman head of Liberty on the obverse surrounded by thirteen stars, and a heraldic eagle in the center of the reverse, with the oval of stars above and a glory of rays above that. In the eleven years Type 2 double eagles were produced, a total of 16,160,758 pieces were struck in three mints: Philadelphia (no mintmark), Carson City (CC), and San Francisco (S). Mintmarks can be found on the reverse below the eagle. In general, Philadelphia coins from 1866 through 1872 are scarce, except the 1867-a hoard date that turned up in Europe in the early 1970s. The 1873 came with two forms of the numeral 3 in the date, closed and open. While the Closed 3 variety is one of the rarer coins in the series, especially in mint state, the Open 3 variety is among the most "common" issues, along with the last two Philadelphia issues, 1875 and 1876. The San Francisco branch mint produced large quantities throughout the 1860s. Apparently many of these pieces were used for international transactions-both during and after the Civil War-as foreign governments were suspicious of U.S. currency at the time. Coins from this mint are frequently encountered in VF, XF, and AU condition, but mint state examples are quite elusive. The 1873-S Open 3 is very rare in all grades and is easily the rarest S-mint twenty of this type. Other than the 1875 issue, all Carson City Type 2 double eagles are rare in mint condition, while the 1870-CC and 1871-CC are major rarities in that state of preservation. Only 3,789 pieces were struck of the 1870-CC and estimates are that today fewer than two dozen exist in all grades. It was during this era that Carson City coins were tainted with scandal: Allegations surfaced in 1871 and continued through 1873 that the mint was issuing lightweight gold coins. Although politically inspired, the accusations proved substantial enough to lead to the dismissal of Superintendent H. F. Rice. Many people in the West questioned the soundness of the CC twenties and frequently made "test marks" on the edge of that mint's gold coins to be certain that underweight coins were not passed. This lack of confidence was serious business in the 1870s, as each double eagle represented a substantial store of value. Although collected by date and mintmark, the main demand for Type 2 twenties comes from type collectors. Advanced type collectors often pursue a representative example from each of the three mints, or possibly one of the 335 proofs struck, which are even scarcer today than the original mintages would suggest. The difficulty of completing a set of this design-particularly in high grade-precludes many from attempting this daunting challenge. In general, most Type 2 twenties in mint state are rare. Representing a month's pay for many people, very few were saved. Those that survived extensive circulation in the West, rough handling in bank-to-bank transfers, or melting in the recall of the 30s-are few and far between. Grading parameters for Type 2 twenties are the same as those for the previous and succeeding coins, with friction evident first on Liberty's hair behind the ear, eye brow and cheek; on the reverse, check the eagle's wing tips, neck, and top of the shield. Counterfeits are occasionally encountered, as well as altered and added mintmarks on some key issues. The modified design of 1866 only lasted eleven years until changed again in 1877, this time by spelling out TWENTY DOLLARS in place of the TWENTY D. of the two previous issues. The Type 3 twenty would continue in production until 1907, when President Theodore Roosevelt committed his "pet crime"-directing a change in U.S. coin motifs, and engaging well-known artists to render designs. The resulting design by Augustus Saint Gaudens for the twenty dollar gold coin was heralded as the most beautiful in U.S. history, and was used until 1933, when all U.S. gold coin production ceased. BIBLIOGRAPHY: Akers, David W., United States Gold Coins, Volume VI, Double Eagles 1849-1933, Paramount Publications, Englewood, OH, 1982. Alexander, David T., DeLorey, Thomas K. and Reed, P. Bradley, Coin World Comprehensive Catalog and Encyclopedia of United States Coins, World Almanac-Pharos Books, New York, 1990. Bowers, Q. David, United States Gold Coins, An Illustrated History, Bowers & Merena Galleries, Wolfeboro, NH, 1982. Breen, Walter, Walter Breen's Complete Encyclopedia of U.S. and Colonial Coins, F.C.I. Press/Doubleday, New York, 1988. Winter, Douglas, & Cutler, Lawrence, M.D., Gold Coins of the Old West: The Carson City Mint 1870-1893, Bowers & Merena Galleries, Wolfeboro, NH, 1994. Winter, Douglas, New Orleans Mint Gold Coins 1839-1909, Bowers & Merena Galleries, Wolfeboro, NH, 1992.